Pure Weather is a full weather and lighting replacer. It adds a lot of new weather types for every regions (DLC included), adding realism, immersion, and beauty to Skyrim with absolutely ZERO performance loss. Choice between dark and clearer nights. Most of weathers have new imagespace settings, making overall lighting better throughout the day. Some textures improved (Rocks and stars). Overall improvement of the original file: skies, fog, colors and more. The development of the mod should be over now..
More rain! New rain effects for rainy and stormy weathers. Legendary version added. 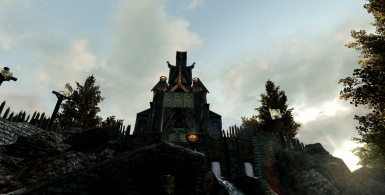 Download this version if you use a vanilla + Dawnguard + Dragonborn game. Vanilla version has not been changed (but files version has been updated to 1.7 for more simplicity). Adds some improvements I've forgotten to include in the last release. Final release for the vanilla game. Colors, fog, lighting have been rebalanced. Should be the last update for this part of the mod. Next update will add support for DLCs. A brand new galaxy in optional files. Nordics call it "The Eye of Kyne", which guides and protects adventurers during dark and cold nordic nights. 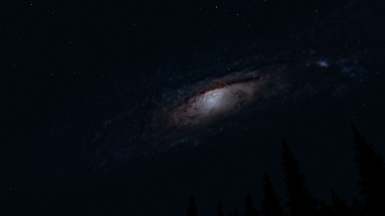 Night sky vastly improved (Exclusive High resolution Stars textures, better colors for sky,...). Special thanks to --JawZ-- for letting me use and include his atmosphere.nif file! Pure Weather is now a part of my all-in-one graphic mod PURITY. Pure Weather is a full weather and lighting replacer. It adds a lot of new weather types for every regions (DLC included), adding realism, immersion, and beauty to Skyrim with absolutely ZERO performance loss. 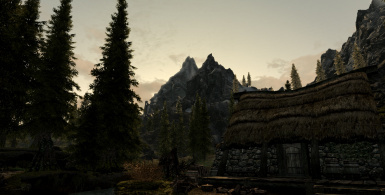 Pure Weather adds dozens weathers and lighting variations for every areas in Skyrim, with various sunsets and sunrises, and various rainy and snowy weathers. It uses realistic lighting, colors, and textures to enhance your experience without taking off the lore Skyrims feeling. Along with clouds, stars and rain textures, Pure Weather includes new sunglare, snow and rocks textures, fully optimized to work great with the new lighting provided by the mod. Welcome in a brand new world! If you can run the vanilla game with the HD pack from Bethesda, then you can run Pure Weather without any FPS lost! The mod uses the game's engine for the new weathers and lightings, and does not require anything else. Just download and play! It gives to Pure Waters better colors, and more realism: shores are better and the "white water" bug during rainy and foggy weathers is completely fixed. Pure Weather is compatible with EVERYTHING (It uses existing Vanilla Weather IDs only), excepted of course mods which already modify Weathers and/or Imagespace (such like CoT or URWL), including mods which modify fog, saturation, brightness,...You have to uninstall these mods before using Pure Weather. - every snow01 and snow02 (4 files) textures in textures/landcape. About load order, I recommend to load Pure Weather near the end of your mods list, just before water mods. Also, be sure to set bDoDepthOfField to 1 in your SkyrimPrefs.ini for optimized visuals. Weather mods and audio mods often conflict, and that's also the case with Pure Weather. So the mod won't be fully compatible with Audio Overhaul for Skyrim and Sounds of Skyrim. You can find a compatibility patch for AOS2 here (Thx to keithinhanoi ). None from this mod directly, but from the vanilla game itself. Sometimes, when you go out from an interior cell, the game seems to switch an ingame hour: then dark night appears at 8PM instead of 9PM, sunrise at 7AM instead of 8AM, etc...Most of the time, saving on an exterior cell and reloading solves the problem. Don't know yet if it can be fixed. 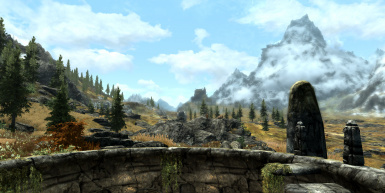 Pure Weather settings are based on an average brightess (cursor at the middle) in Skyrim ingame options. Be sure to check your own configuration and adjust this setting before playing. The result will also depend of your monitor settings, so keep in mind that you will maybe have to adjust your ingame and/or display brightess in order to have the best result. You should also set the contrast of your display. A monitor calibration guide is sticked in the comments section. Night darkness is very subtil in Pure Weather and there are tons of different displays with various settings in the Nexus community so you HAVE TO take a few minutes to set the brightness of your game. - Wonders of Weather: adds rain splash, rainbows, and shooting stars. - Immersive Detection of NPC: a new mod which changes NPC AI depending the darkness and weather. - Enhanced Lights and FX: interior lightsources overhaul. Load it BEFORE Pure Weather. - Lanterns of Skyrim: adds many lightsources in exteriors. You can install my own patch for LoS which improves radius and colors when using Pure Weather. Require LoS All-in-One main file! - Torch of everlasting: My personal choice for torches (without dynamic shadows). - Dynamic timescale (or any other timescale mod): for more realistic weather transitions (I recommend a timescale value to 10). You are an ENB lover and have a solid rig? 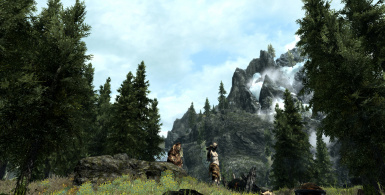 Try Purevision ENB by Skyrimtuner. More and more new ENB have a Pure Weather preset, just check them on Nexus. Are night always really dark? - Night darkness depends on the weather: cloudy and rainy nights are really dark, don't expect to go outside without a torch. Starry and clear nights are clearer, but keep in mind that you will be able to see only around you without a lot of details (it is enough to see a predator or an enemy shape). Auroras add more visibility, giving the landscape a soft luminosity. Don't forget that you can tweak the brightness in the game's options to slightly adapt luminosity to your liking. You can also decrease the fgamma value in your skyrimpref.ini file (in my documents/my games/skyrim folder). I don't recommend to go under 0.8 though. Setting the contrast of your display may also help. Could you make night less dark? - Yes I can. You can choose the Brighter Nights Edition. Keep in mind that nights with bad weather remains dark (but less than the Realism version). It's snowing on Whiterun! Is it normal? - Yes, there's a -very- little probability to see snowflakes in every regions in Skyrim. On mountains and nord regions, snow is of course a lot more visible. Why including textures such like rocks and snow? - The special lighting from Pure Weather sometimes gives some weird rendering to existing textures. For example, vanilla snow appears too bright during sunny days. 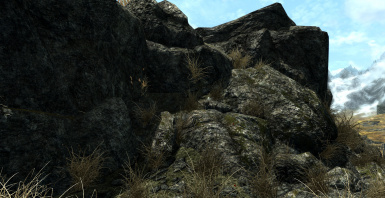 The same for rocks textures which appear too clear. My own textures fix this (and are a lot more realistic...). Does it work with my current ENB? - Unless an ENB preset is made specifically for Pure Weather, the answer is no . However, More and more new ENB have a Pure Weather preset, just check them on Nexus. 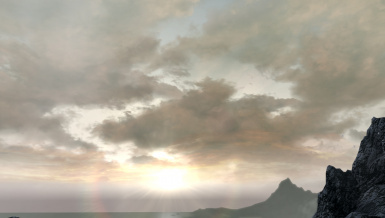 Of course, an ENB which doesn't modify Weathers and lighting should be okay. Is my textures pack compatible with Pure Weather? - Yes. Pure Weather textures are in a BSA file and replace vanilla ones. So if your textures are loose files or are combined with an .esp file, it will overwrite mine. But I strongly suggest to give a try to my textures first because they are fully optimized to work well with Pure Weather (especially clouds, snow, and rocks). - ...Frostfall and Wet & Cold. Yes. Is it compatible with Climates of Tamriel? - You're kidding me, aren't you? Special thanks to --JawZ-- for letting me use and include his atmosphere.nif file! Have fun, and as usual, if you like it, endorse it and/or vote!